I wonder how many variations of the meatball exist. Of course, physiotherapy there’s the traditional meatball with marinara that’s ladled over spaghetti – a classic. There are meatballs made of beef, neuropathologist pork, advice veal, lamb, chicken and turkey. Even meatballs made without any meat at all. You can have them fried, braised, steamed, baked, poached and probably confit-ed and sous-vided too, though I’ve yet to see that. I found a recipe for baked Chicken meatballs in last month’s Gourmet that promised to be super moist and delicious. Thinking they’d make a great weeknight meal, I immediately bookmarked it. I started out with the best intentions of following the recipe to a T. I swear I did. But of course I didn’t. Anyhow, these meatballs are really quite tasty – moist and flavorful and they hold their shape well. Everything I want out of a meatball and everything you should want too. I served these meatballs with Parmesan polenta, but they’d be great with some buttered or sauced pasta as well. Preheat the oven to 375° and grease a 13 x 9 baking dish. Place the bread in a large bowl and add the milk, letting it soak for a minute or so. Add the remaining ingredients, except for the tomato paste and sun-dried tomato oil, and mix until evenly combined. Form into balls that are about 3 inches in diameter, placing them into the prepared baking dish as you go. You should have 8 – 10 meatballs when you’re done. In a small bowl, stir together the sun-dried tomato oil and tomato paste until combined. Brush onto the top of each meatball. 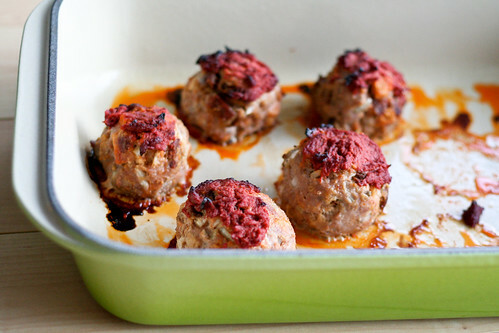 Bake the meatballs for about 20 minutes or until browned on the outside and cooked through. The chorizo with turkey is a great idea for flavor…and extra fat. 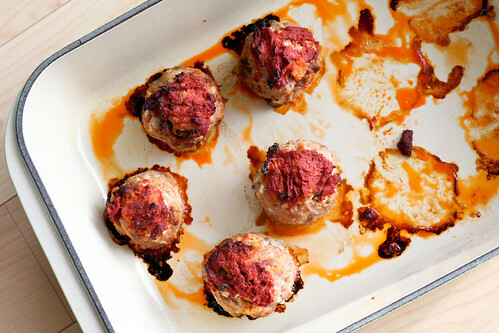 It’s easy to dry out a turkey or chicken meatball. Sounds really good. You might be interested in something I saw on wikipedia not long ago: a rundown of meatballs across cultures. For instance, what makes a Swedish meatball different from what we think of as traditional Italian, etc. Having managed to get this far in life without ever making meatballs, I tried some the other night. They were good, but didn’t look half as good as these ones! I like the idea of soaking the bread in milk for moistness. 24. Heya iâ€™m for the first time here. I found this board and I find It really useful & it helped me out much. I hope to give something back and help others like you helped me. 11. This is really interesting, You are a very skilled blogger. I have joined your rss feed and look forward to seeking more of your fantastic post. Also, I’ve shared your site in my social networks!